Monday, July 23rd: Tapping of Bell’s Hopslam at 6pm. Just a note here, we don’t condone this at all. This is a sought-after beer that comes out once a year, this year somewhere around January. Unlike many high ABV beers, this doesn’t age well and will be a shell of its former self. It’s a shame to see a bar holding onto a beer like this for so long, and worse yet, actually serving it to patrons. Tuesday, July 24th: Flight night featuring Uinta Detour Imperial IPA, Uinta Hopnotch IPA, 21st Amendment Hell or High Watermelon, and Elysian Dragonstooth Stout. Starts at 6pm. Wednesday, July 25th: Can beer picnic: menu will feature hot dogs and picnic sides. Starts at 6pm. Thursday, July 26th: Flight night featuring Young’s Double Chocolate Stout, Timmerman’s Strawberry, Blanche de Bruxelles, and Well’s Bombardier. Starts at 6pm. Friday, July 27th: Sly Fox Chester County Bitter on cask. Starts at 6pm. Saturday, July 28th: West End Craft Beer Crawl and tapping of some new Doylestown Brewery jawn: Union Street IPA and R5 Lager. Sunday, July 29th: Tapping of Dogfish Head’s 120min IPA at 1:20pm sharp. Get some. The Tavern on Liberty in Allentown is hosting an Evil Genius Beer Company flight night tonight from 7pm til 11pm. Evil Genius is a PA-based duo of brewers who are contract brewing their beers out of Four Horsemen Brewing Company in South Bend, Indiana. The Tavern on Liberty is hosting a Sly Fox Brewing (they seem to be all over the valley lately, don’t they?) tap takeover tomorrow, January 26th. 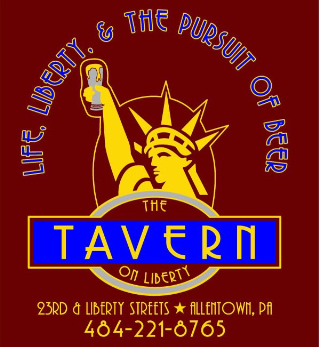 The Tavern on Liberty is hosting an Avery Brewing Company tap takover tonight. e Tavern on Liberty is hosting a tap-takeover tonight at 7pm with Left Hand Brewing out of Colorado.